We all know that feeling. That one where you can’t get that certain person out of your head. When you find yourself daydreaming about them in the middle of the afternoon. Or like in Ross’s case, when you wake up in the morning with dreams of them still playing in your head. For Ross, that was the moment when he knew what he had with Jo was “something major” and lucky for him, she felt the same way. So after meeting up for the first time in person at the St. Louis Zoo, they decided to see if their love could last the time apart. Nothing puts puppy love to the test quite like a long distance relationship. Through online chat rooms and over skype dates, they only grew closer and more fond of one another. 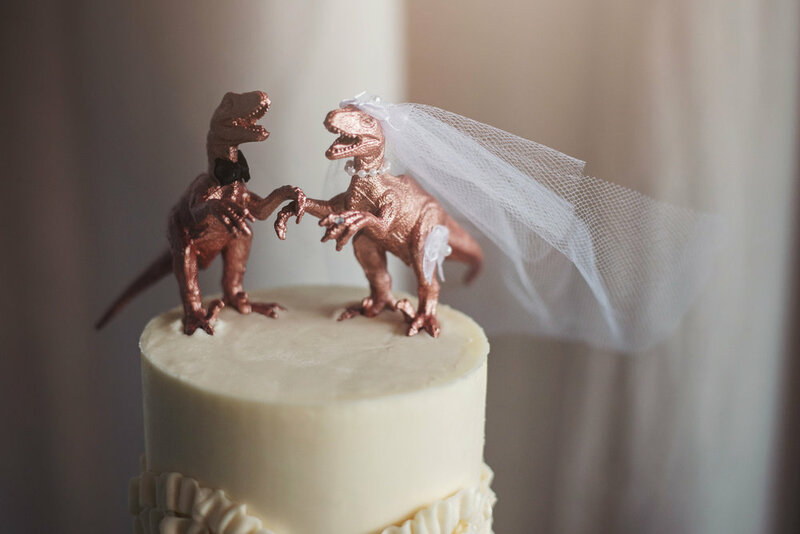 And in early spring, just a few years after their first date at the zoo, they walked down the aisle and began their new life together forever. 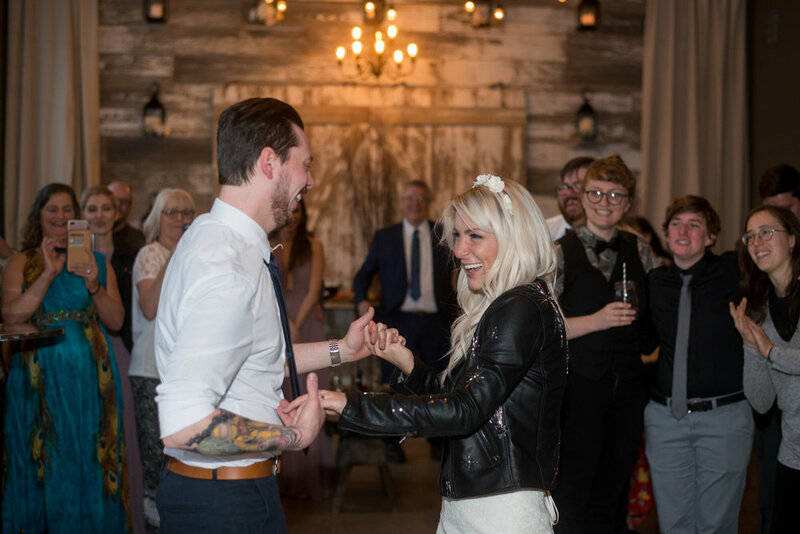 We were so honored to host a courthouse style mini ceremony and celebration for Jo and Ross along with a dozen of their closest friends and family. Join us in saying congrats to the long distance lovers. May you be side by side for the rest of your days! Watch Jo & Ross exchange vows in a mini ceremony & celebration on their episode of “15 Minute Wedding”. The word is out! 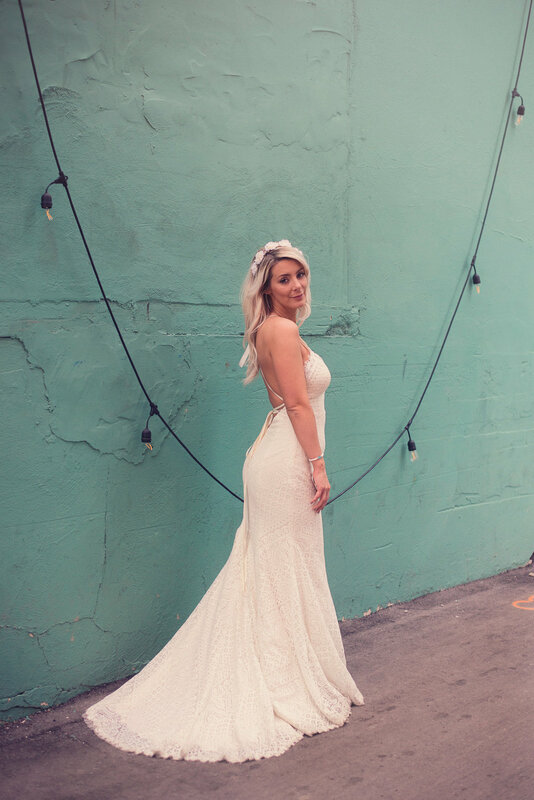 You don’t have to go to the courthouse to have a low key, stress free, budget friendly wedding in KC. Jennifer & Steven can testify to that fact. Their little family spent a half hour at The Chapel at Heritage Hall on a chilly but sunny Saturday in January. In that short time, Jennifer & Steven (directed by our lovely officiant) exchanged rings, said “I do”, and were pronounced husband & wife. 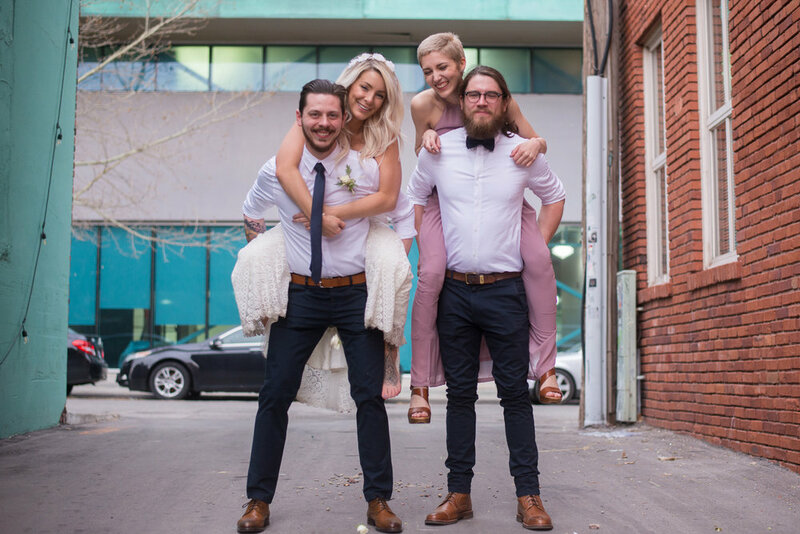 On top of all that, they had a mini photoshoot, with our expert wedding photographer, capturing their ceremony and their first moments as an official family! 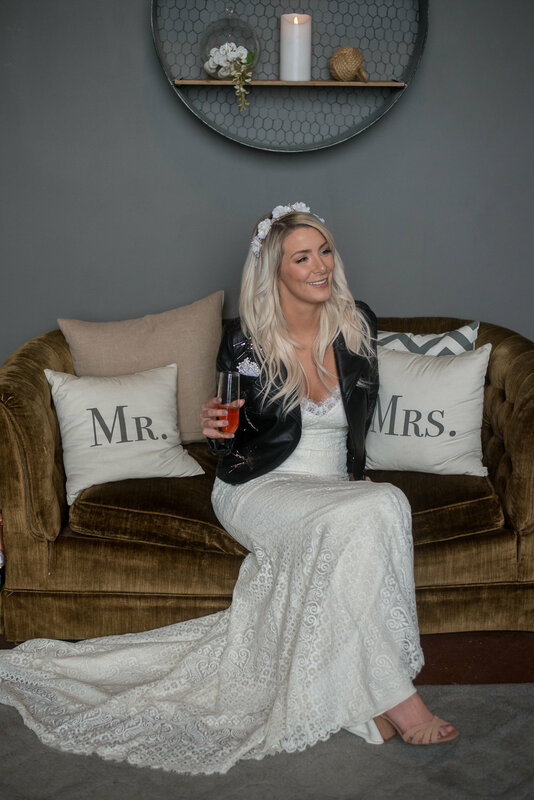 As a bride who didn’t see the appeal of walking down the aisle, Jennifer knew our courthouse style mini ceremony package was the perfect fit for her and her maverick fiance. 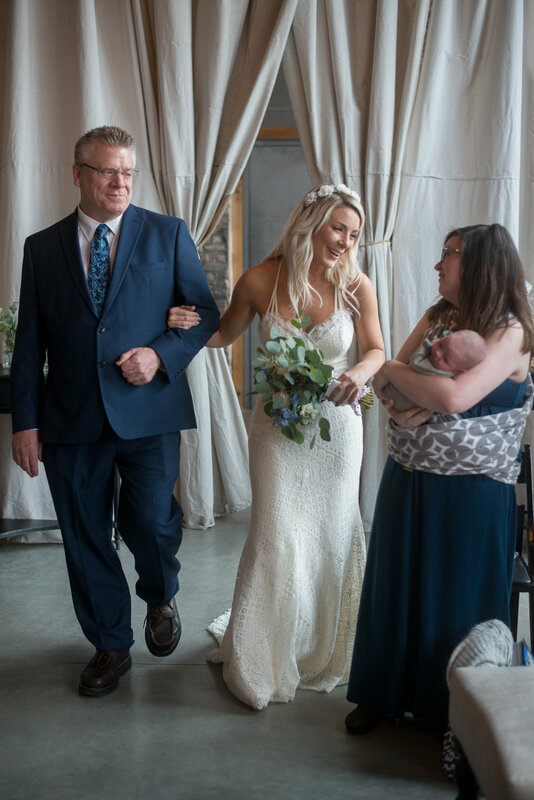 Instead of a ceremony full of pomp and circumstance, Jennifer & Steven opted for sharing the spotlight with their little girl. 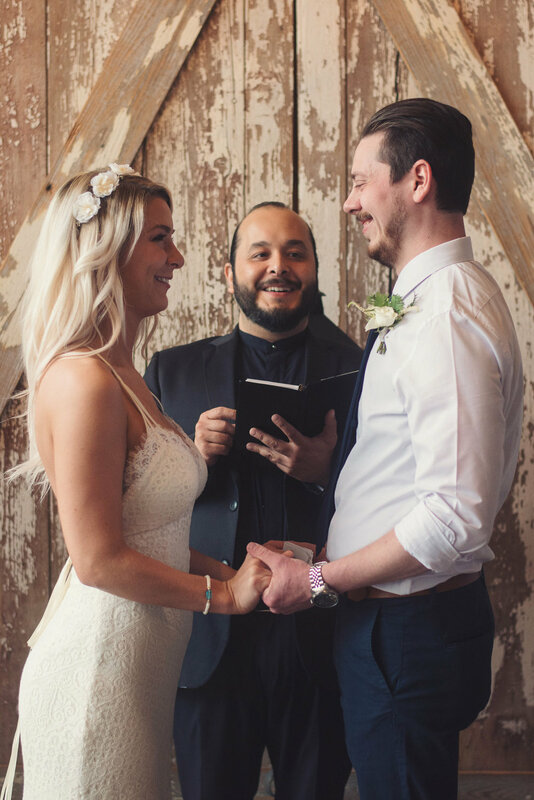 The family of three stood at our altar and promised to be there for one another for the rest of their lives. 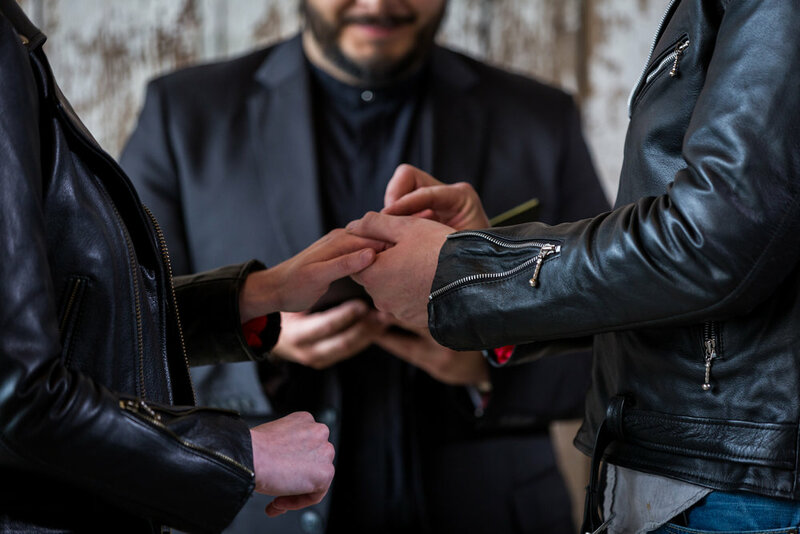 We are thrilled to have the opportunity to share their incredibly intimate ceremony with the world, and hopefully inspire more couples to buck tradition and instead focus on what matters most! 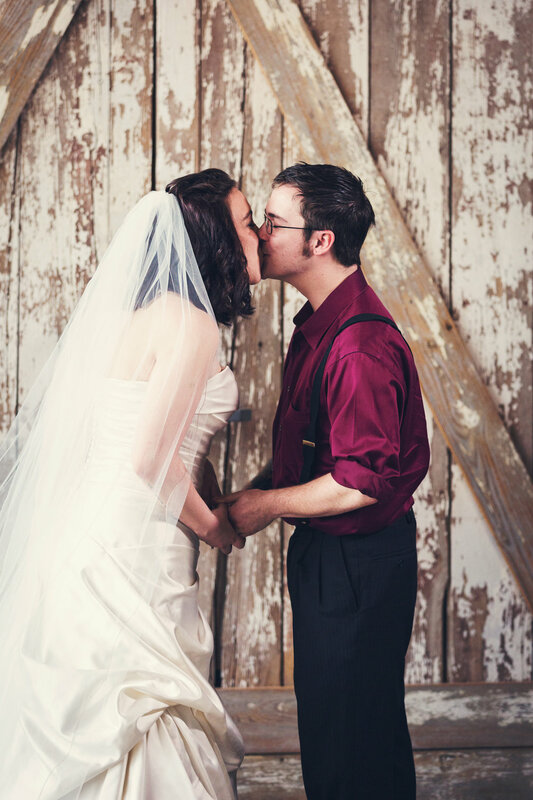 See another joyful couple get hitched at The Chapel at Heritage Hall! JESSICA & JAMES - JOYFULLY JOINED! Linda knew there was something special about Michael when they first met and it didn’t take long before she knew that she wanted to spend the rest her life with him. So that was that. 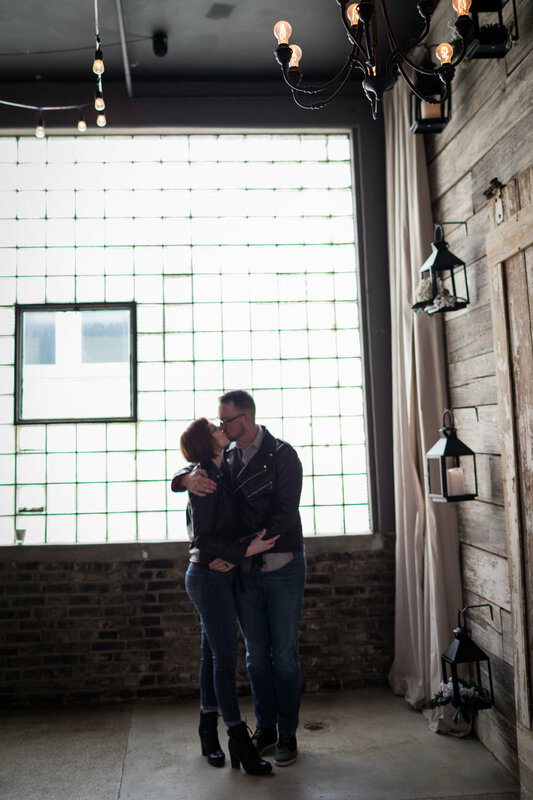 Linda & Michael got engaged and began planning a big wedding. But, as cliche as it is to say, life had other plans. Linda was struggling to find a date and location that worked for the entire family, when suddenly she found out she was pregnant with Michael’s baby girl. Time spent finding the perfect dress and shoes quickly changed to time spent researching a safe crib and car seat. 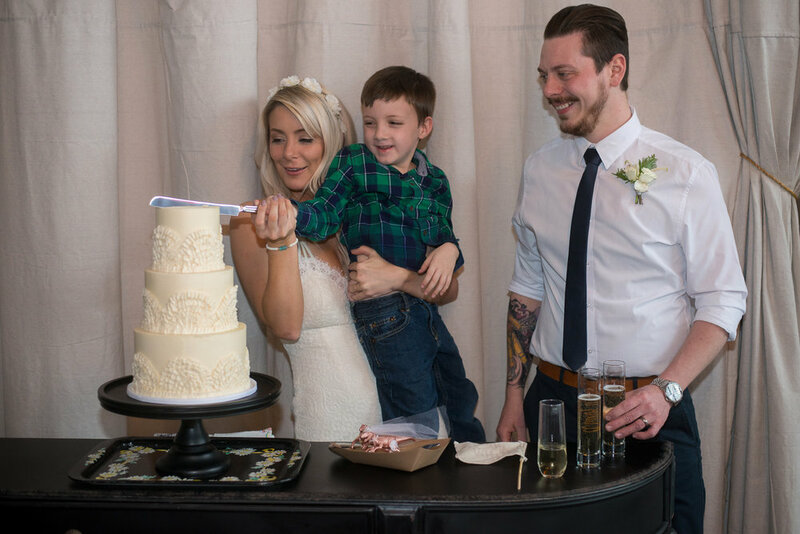 Their family went from a party of two to a party of three and Linda & Michael embraced their new roles as mom & dad. Before they knew it, their baby girl was becoming a toddler and they were still in the “fiance zone”. Linda knew she wanted to be married to Michael, but she also knew she wanted her wedding to be something where she could, “have my dress and have the pictures and the memory of actually getting married without going to a courthouse in my jeans.” This time life listened and Linda & Michael eloped exactly the way they had dreamed of: just the two of them in a mini ceremony at our small wedding chapel in the heart of Kansas City (all captured by our seasoned wedding photographer). Life must have been listening closely as they were able to elope with us on the exact date of their four year anniversary. So today we toast the newlyweds, Linda & Michael - cheers to your love, faith, and most of all, patience! Peak in on Linda & Michael’s private elopement on Season 1 Episode 4 of “15 Minute Wedding”! Oh Shelby & Steven. 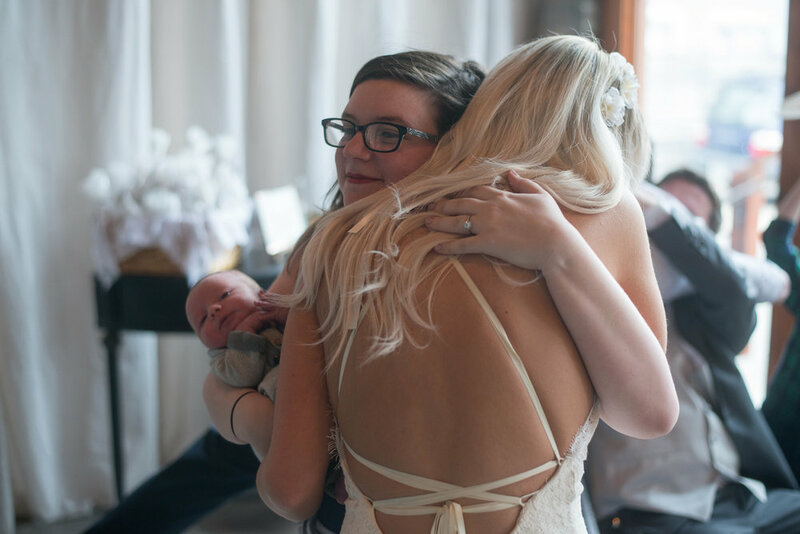 I swear, these two are the sweetest souls that have graced our small town wedding chapel. They have the kind of raw, fresh energy that only comes from two youngin’s in love. 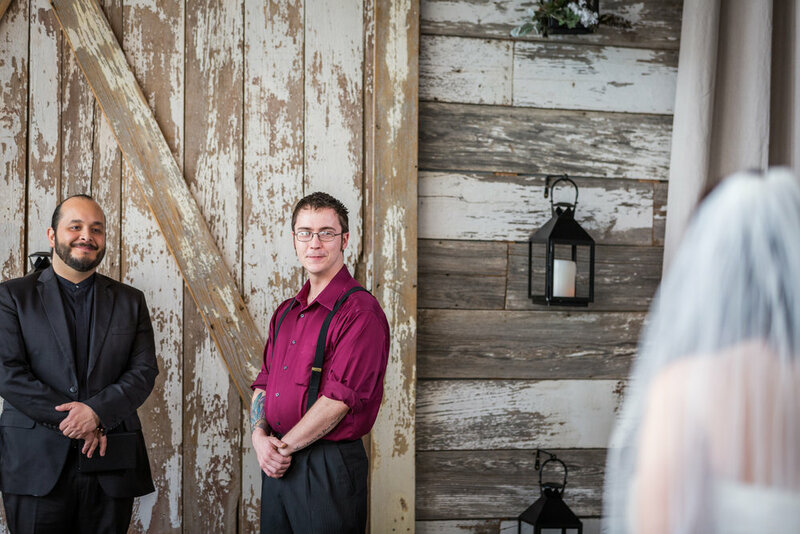 We have a unique affection for December weddings, so we were extra excited when Shelby & Steven decided to have a small and quaint wedding with us on a gorgeous Sunday in December. 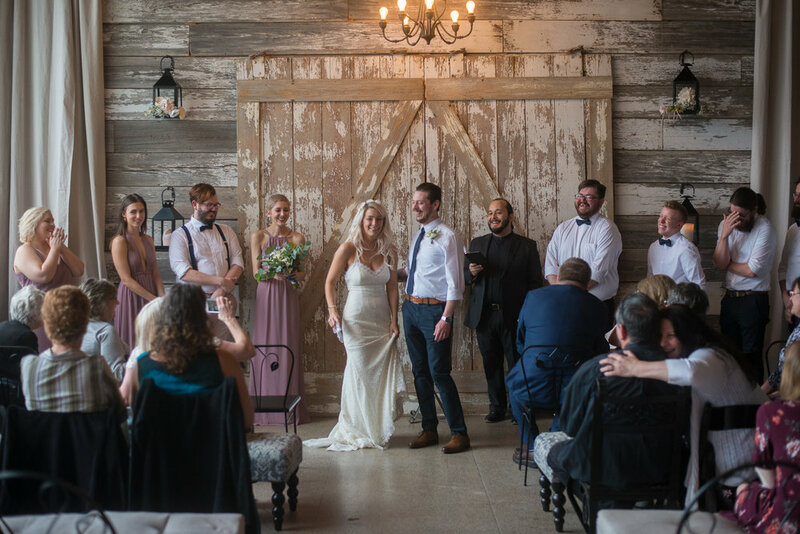 The Chapel felt especially warm and bright on the Kansas City winter day and our photographer was able to flawlessly capture the golden hour radiance of Shelby & Steven’s wedding. 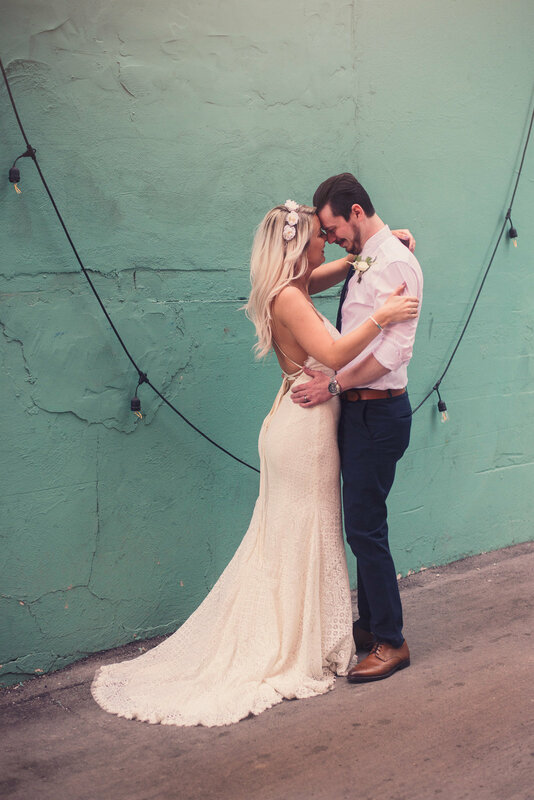 See for yourself as we’re sharing (almost) the entire album of Shelby & Steven’s special day with you guys right now! P.S. Shout out to our florist who knocked this customized bouquet & boutonniere out of the park! 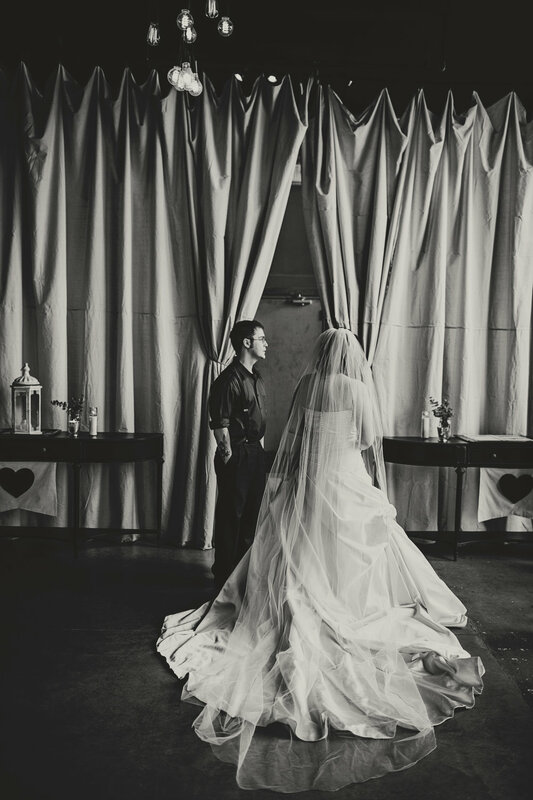 See more young lovers spend a day at The Chapel at Heritage Hall! DESIREE & ALEX, SO IN LOVE! 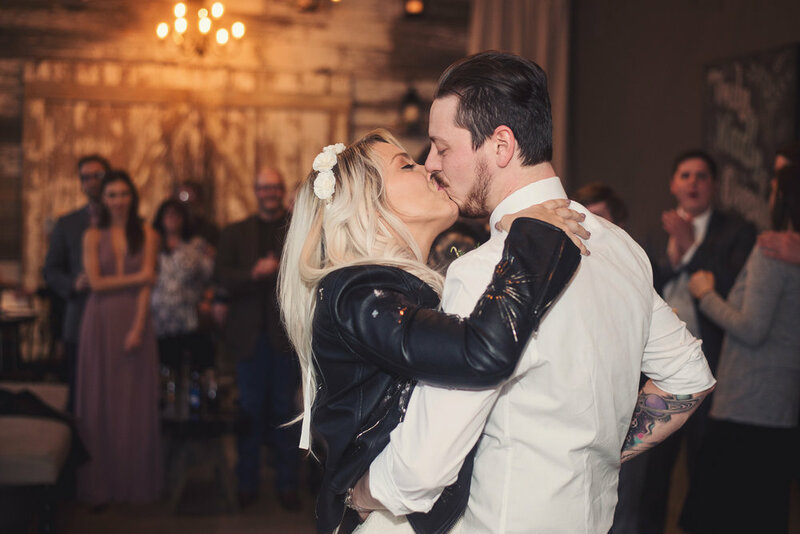 Let us introduce you to another one of Kansas City’s coolest couples, Lauren & Dalton. 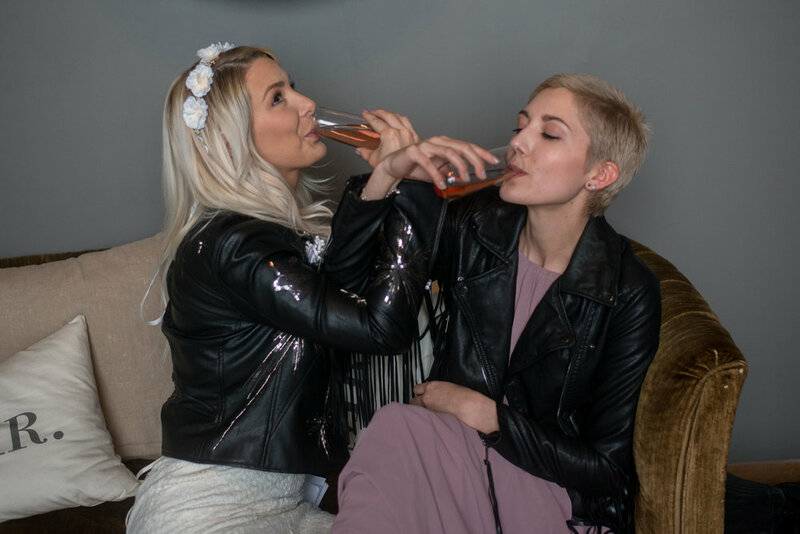 So cool in fact, on their wedding day the bridal party rocked leather jackets, the cake was topped with T-Rex cake toppers, and champagne flowed from the “Drunk in Love” champagne flutes (made by our own Suite Heart Shop). 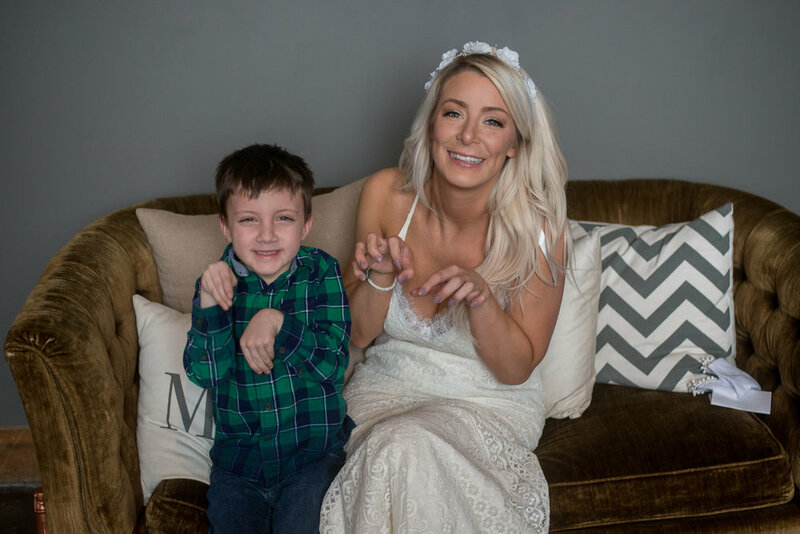 Yet, the coolest part about Lauren & Dalton has nothing to do with the “things” at their wedding, but everything to do with the “feels” at their wedding. 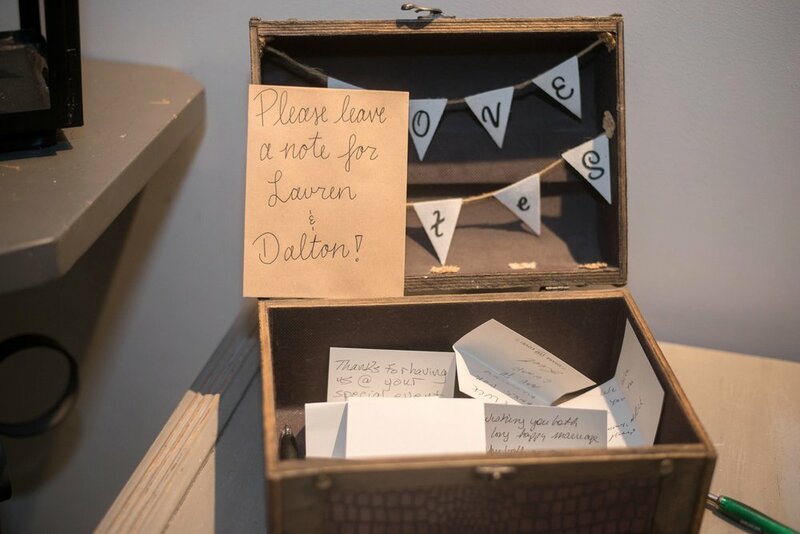 Lauren & Dalton share that kind of love that is so strong you can see it in the way they look at each other. It is clear on both their faces that they are completely intoxicated with everything about the other person. 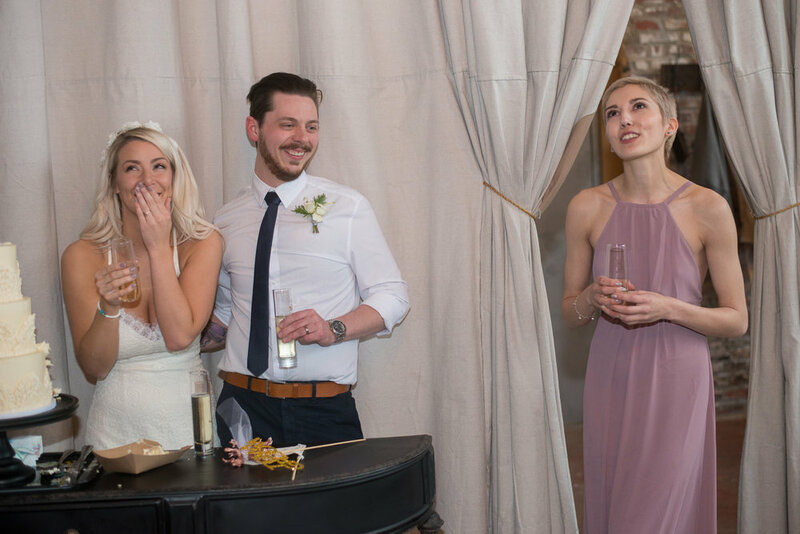 And on their wedding day, everyone in the room experienced their intoxicating love first hand. Now we’re giving you a chance to experience it yourself with a glimpse into their mesmerizing wedding album! 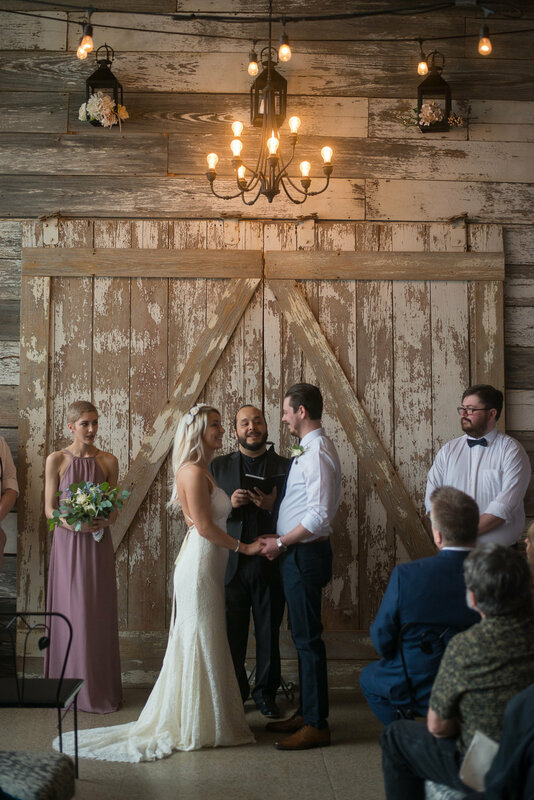 WEDDING CEREMONY, COORDINATION, OFFICIATING, RECEPTION PLANNING, PHOTOGRAPHY, CAKE, CATERING, BOUQUET & BOUTONNIERE ALL PROVIDED BY THE VOW EXCHANGE EVENTS. 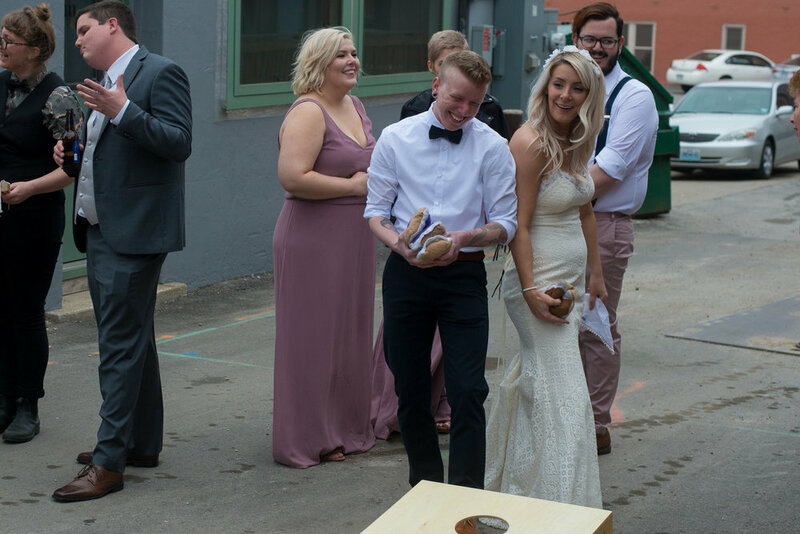 Lexi & Andrew also spent their wedding day totally totally “drunk in love”. Kati & Dustin are, hands down, the coolest couple in town. They are the kind of couple who is crazy about each other in a way that makes you crazy about them. They are the kind of couple who is authentic and free spirited. They are the kind of couple that has leather jackets, MATCHING leather jackets! 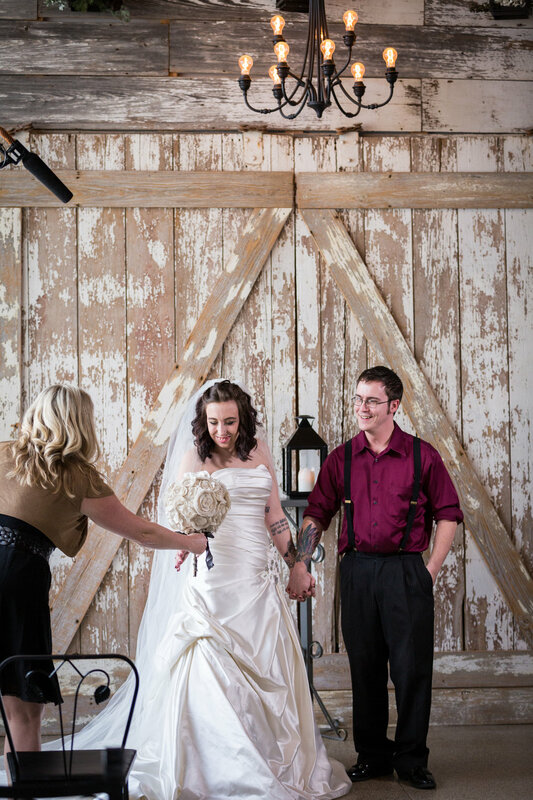 So when Kati & Dustin decided to get married, they knew they were going to have the kind of wedding that they wanted. For them, that meant a wedding with no guests. For them, that meant wearing what they might normally wear to their favorite bar, the bar where they first met. And for them, that meant a wedding where they could dance down the aisle, hand in hand, before saying “I do”. 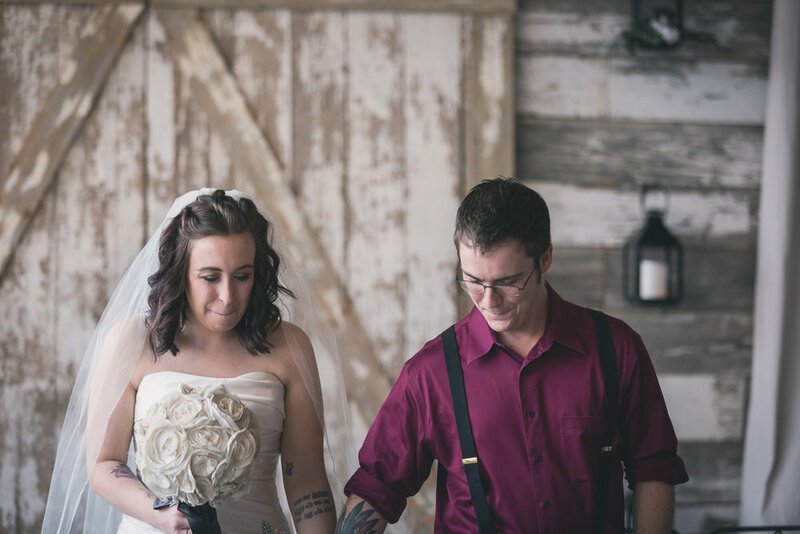 We were lucky enough to capture Kati & Dustin’s intimate wedding and we want to share some of the coolness with you! 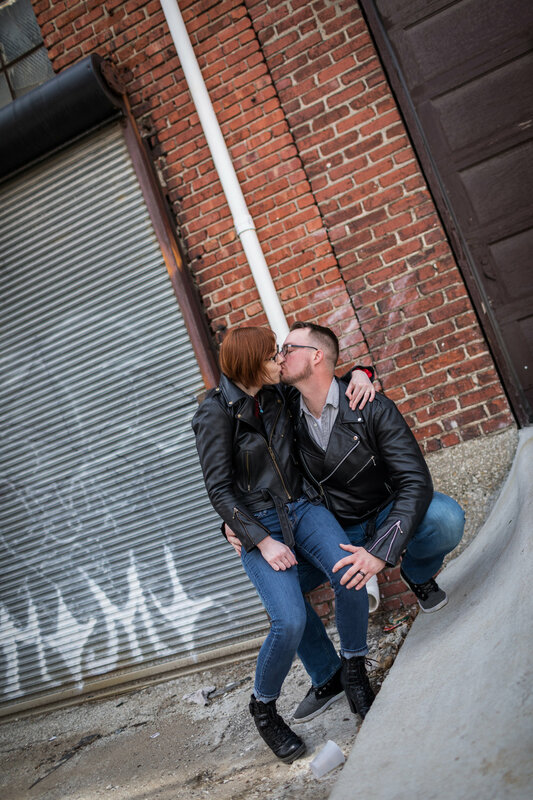 Join us in congratulating these newlywed rebels! And don’t forget, you can watch the entire love story unfold on 15 Minute Wedding! 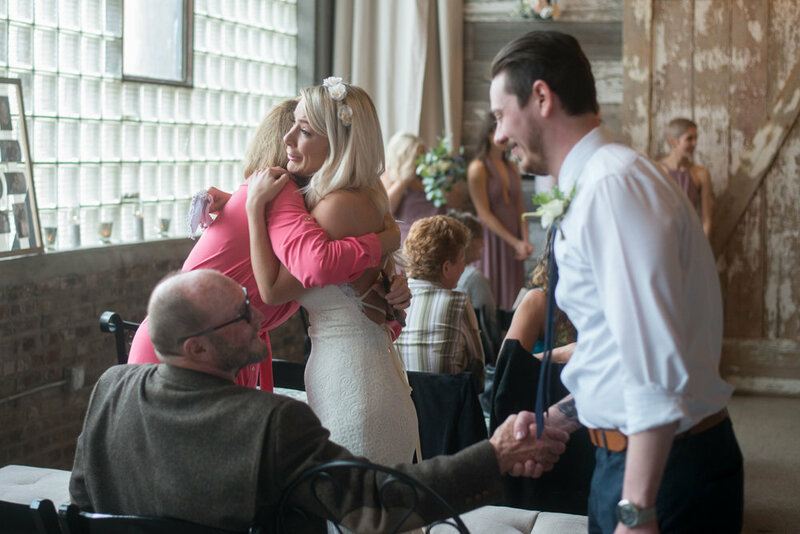 Hear the shocking way in which Kati & Dustin first met and watch their entire wedding on Season 1 Episode 3 of 15 Minute Wedding!